There is good reason for the US to implement Turkey's recognition of the Armenian Genocide as federal policy given that the "Greater Middle East" is so vital to American interests. It’s that time of the year again. The run-up to the 24th of April – Armenian Martyrs’ Day – usually sees a slew of activity in Washington with one of the nation’s most persistent ethno-national lobbies clashing with the millions spent in counter-advocacy efforts by an active long-time member of NATO and close ally of the United States. It is not a balanced battle, but even though American citizens of Armenian descent have been a presence in Washington since the 1970s, all the political and financial clout coming out of Turkey has managed to stop short a presidential acknowledgement of “the g-word” (even if it was sort of slipped in a speech by President Ronald Reagan to commemorate the Holocaust). And even though the US Congress has twice, in 1975 and 1984, gone ahead with condemning “man’s inhumanity to man,” the recognition and commemoration of the Armenian Genocide at the national level has never been implemented as a federal policy. It is a struggle that does not look like it’s going away soon. US presidential candidates for the past twenty years have used the genocide card to sway voters in such key states as California, Massachusetts, New Jersey, and Michigan, which large numbers of Armenian-Americans call home. But each candidate has reneged on his promise to fully acknowledge the Armenian Genocide as such. Indeed, this last race to the White House was unusual in that it did not bring up the massacres and deportations that took place between 1894 and 1923 – or “the events of 1915,” as is the euphemistic way of putting it, preferred by Turkey. 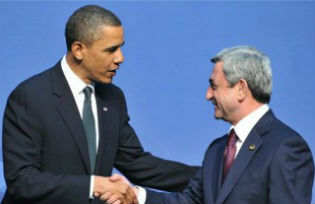 Barack Obama was perhaps the most vociferous proponent of Armenian Genocide recognition both as a senator, as a candidate, and even as president when he made his first trip abroad soon after taking office in 2009, speaking in Ankara at the country’s parliament. He fell short, however, once the first April 24th of his term passed. But why should this nearly-century-old historical dispute matter at all? To begin with, the United States itself played an immense role in the history of the Armenian Genocide. The most telling, poignant, and verifiable first-hand accounts of the genocide come from American sources, usually missionaries who were sent to work in the area. The most reliable news sources and figures from that era, again, are the reports filed mostly by American newspapers and journals. After the fact, the efforts directed towards helping “the starving Armenians” (a common phrase – a meme – of the time) was an important precedent for the future of humanitarian work the world over. Something like celebrity fundraising that we take for granted today, for example, finds its origins in the young star Jackie Coogan’s efforts for the Armenian, Greek, and Assyrian/Syriac refugees of the Ottoman Empire. Indeed, US President Woodrow Wilson is a national hero for the Armenians not only because he strongly backed an independent Armenian state at the time, but also because the American Committee for Syrian and Armenian Relief set up under his watch (now Near East Foundation) saved literally tens of thousands of Armenian lives, including thousands of orphans. So significant were its efforts that it was one of the few foreign organizations allowed to work in the USSR during its early years, as refugees filled the Armenian-populated lands of the Russian Empire next door, part of which became a Soviet republic in 1920. Much more significantly, however, although the Armenian Genocide as a social and cultural issue remains unresolved, it has turned into a political and diplomatic matter since an independent Republic of Armenia has emerged following the collapse of the Soviet Union. It is a major hindrance to peace in a region that is increasingly being perceived more meaningfully as “the Greater Middle East” – an area that, no need to mention, includes Israel and Iran, the sizeable Kurdish presence in Turkey right next door to a just-about-sovereign Iraqi Kurdistan, as well as the Kurdish-populated regions of a collapsing Syria, to say nothing of the oil factor in both the Gulf and the Caspian, and the territorial disputes of the South Caucasus. History is very often informed by geography which, in turn, goes a long way into shaping policy for the states, territories, and peoples of that area. The United States has its own historical and moral imperative in addressing the Armenian Genocide meaningfully as a nation, but the issue has cause for real concern as a factor in the stability of a neighborhood with which the present of America is inextricably linked, and for which the future may yet hold unexpected developments. Taking the Armenian Genocide issue head-on at home and encouraging Turkey to do the same could only serve to settle at least one dispute in an unstable region. Nareg Seferian is a candidate for a master’s degree with a focus on Armenian-Turkish relations at the Diplomatic Academy in Vienna, Austria, and the Fletcher School of Law and Diplomacy at Tufts University. His articles and essays can be read at naregseferian.com.